It was a marvelous morning for Amazon's The Marvelous Mrs. Maisel. The series, which already won two key Golden Globes, received 14 Emmy nominations on Thursday, July 12. The series was nominated in a bevy of comedy categories, including writing, directing, lead actress, supporting actor and supporting actress. They found all of this out in the middle of shooting. 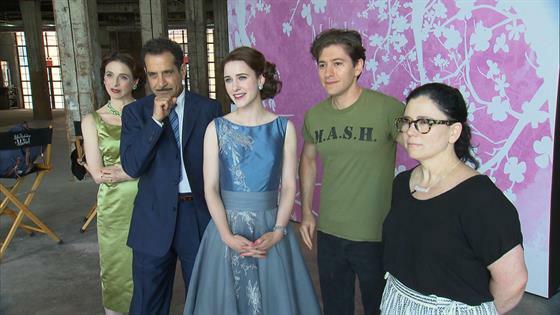 "We're a little confused and overwhelmed," Rachel Brosnahan told E! News on set of The Marvelous Mrs. Maisel. The cast was in the middle of filming when the nominations were announced by Samira Wiley and Ryan Eggold. And it wasn't just any scene they were filming. "We're in the middle of a three-day, very gigantic scene, very intense, lot of people, lot of background and we're trying to finish it up today, so we're a little disoriented being not on the set, talking to you guys, but we're thrilled," Tony Shalhoub told us. "We just know that we have a boatload of work left to do today." Because of that "boatload of work," the cast will not be celebrating. "But I can't think of any place we'd rather be than with this entire cast and crew and all of our background actors working on season two when we've received such wonderful news about season one," Brosnahan said. The Marvelous Mrs. Maisel, a period comedy, follows Brosnahan's Midge Maisel, a housewife who embarks on a career in standup comedy in the 1950s. She's getting a divorce and finding her voice. "An important distinction between season one and season two is that during season one, it was centered around Midge finding her voice, finding her voice anew I should say. And in season two, we're going to see more of the ripple affect, how that touches everyone else in her world, because while that's so thrilling and a huge personal development, it's not without consequence to those around you when you uproot your entire life that way. I think that's something that will be explored more in season two," she said. "And then season three is just getting her to shut up," Borstein cracked. The Marvelous Mrs. Maisel will return to Amazon in 2018. The Emmys air Monday, Sept. 17 at 8 p.m. on NBC.